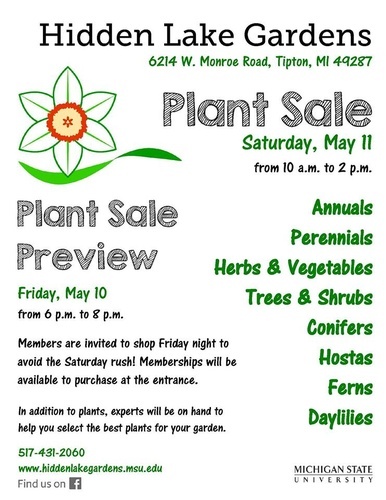 The annual plant sale - a fundraiser to support programs and plantings at Hidden Lake Gardens! Plants for sale include perennials, shrubs, trees, conifers, annuals, herbs, vegetables, hostas, daylilies, and flowering plants for Mother's Day. Sale opens at 10 a.m. and closes at 2 p.m. Arrive early for the best selection and availability.